The Ministry of Land, Infrastructure, Transport, and Tourism (MLIT) planned to build a dam on the Nagara River in the 1960s as part of nation's comprehensive water resources development policy. This policy corresponded with the trend of water policies at the time, including U.S. reclamation policies, in which rivers like the Missouri and Columbia were regarded as resources to be fully used for human beneficial purposes. When the Japanese government promulgated law to promote the development of water resources in 1961 and established the Japan Water Agency, it identified five major watersheds for comprehensive development, including the Kiso River-Nagara-River watershed that runs through the Nagoya industrial area. Other prominent watersheds were the Tone River watershed in the Tokyo area and the Yodo River watershed in the Osaka area. A series of dams were planned mainly to secure water supplies to expanding urban areas and industries. The Nagara Estuary River dam was planned as part of this larger policy framework. The location was to be within five kilometers from the Ocean. Partly to gain support from local people for this plan, the Water Agency emphasized the need of the dam to prevent frequent floods and damages to the lower stream residences. However, the main purpose of constructing this dam for the government's perspective was to prevent sea water from contaminating agricultural and industrial water supplies. The government approved this dam scheme in 1968 but took more than 15 years to negotiate with fishermen's communities. In the 1980s, when the boom of industrial developments subsided and the rise of the middle class leading to the increasing awareness of environmental protection, the dam construction plan met another strong opposition. Most major rivers by then had been heavily polluted by intensive industrial activities. The Nagara River was the only river in Japan without a dam. Some lower stream fishermen depended on their livelihood from harvesting fresh water clams. The river also had some endemic trout species and important sources of livelihood for fishermen. 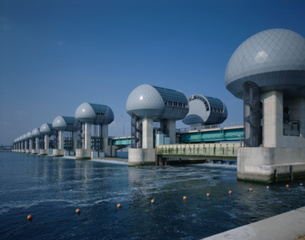 Despite the opposition, the dam construction was completed in 1994 and began its operation in the following year under the Japan Water Agency, now an incorporated administrative agency. Project Details The dam was build at the mouth of the Nagara River. The length of the dam is 661 meters, the height 8.2 meters. The construction work was commissioned to the Taisei Corporation, Kashima Corporation, and Penta-Ocean Construction Co., Ltd. The construction began in 1968 and was completed in 1994. It is located in Nagashima town, Kuwana city, Mie prefecture. Development of Alternatives The opposition proposed to maintain the Nagara River intact without building any dam structure. Why? Explain briefly. The governments of prefecture and municipalities along with local residents who had suffered from frequent floods strongly promoted the construction of the dam. On July 2, 1991, the New York Times published a half-page ad for the opposition group. This galvanized a number of letters to the Ministry of Land, Infrastructure, Transport and Tourism, asking it to stop the construction. Many Japanese books were published in the 1990s both by opposition groups and promoters. Japan Commission on Large Dams, Dams in Japan: Past, Present and Future (CRC Press, 2009). Satoshi Nakazawa, "The development of river management: Tone River," In Rutger de Graaf and Fransje Hooimeijer, eds., Urban Water in Japan (Taylor & Francis, 2008): 103-118. Mantaro, Kuno. Kensho Nagaragawa Joho Senso. Doyukan, 1993. Toshiko Niikura. "Campaigns against Dams in Japan and the Nagara River Estuary Dam." Organization & Environment (March 1999): 99-104. Miori Aoyama. "Nagara River Estuary Dam and River Policy Network." Hitoshi Mutoh. "The Aichi Targets from the perspective of the Nagara River."